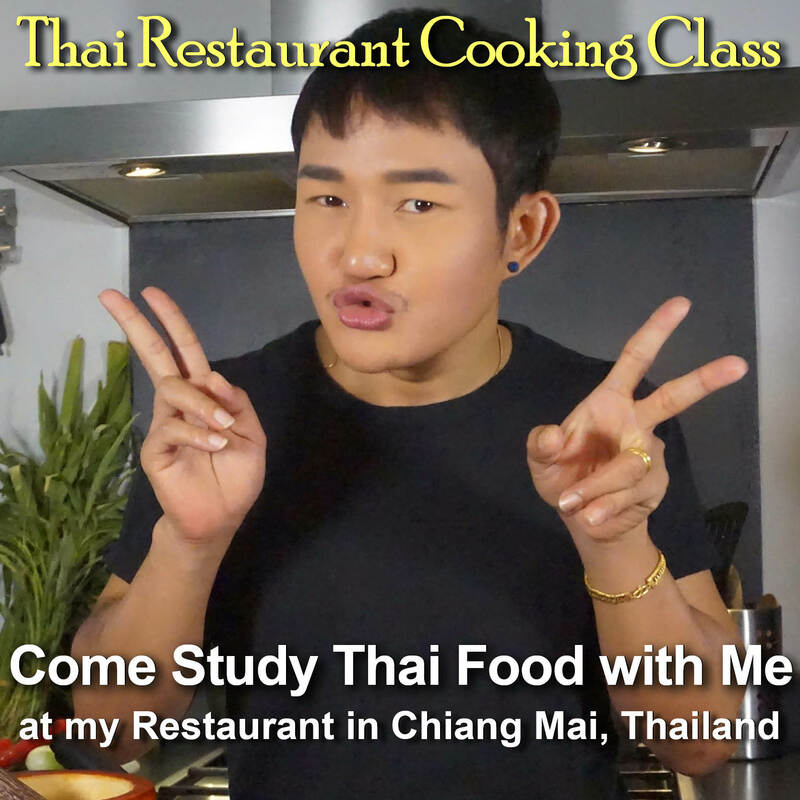 Learn to make these delicious and authentic Thai style satays at home with this easy to follow recipe. A succulent plate of chicken or pork satay flavored with this excellent marinade of lemongrass, galagal, and other herbs and spices, and some of our sweet peanut sauce are sure to be a hit at your next party. 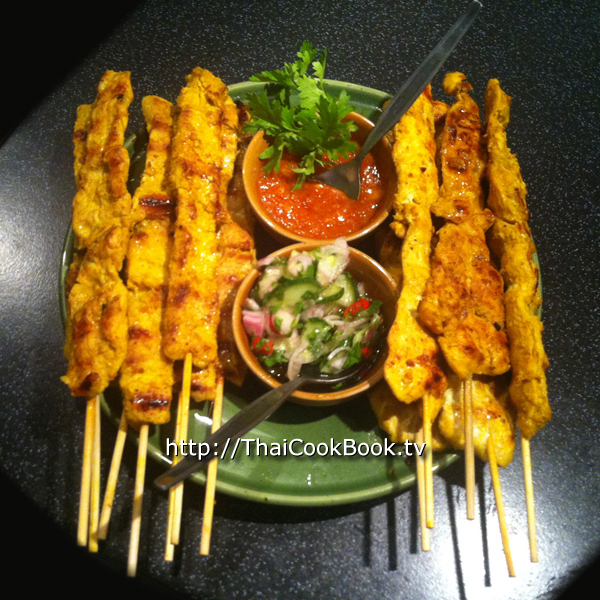 Satays make an excellent appetizer or can be prepared ahead of time for picnics, parties, etc. 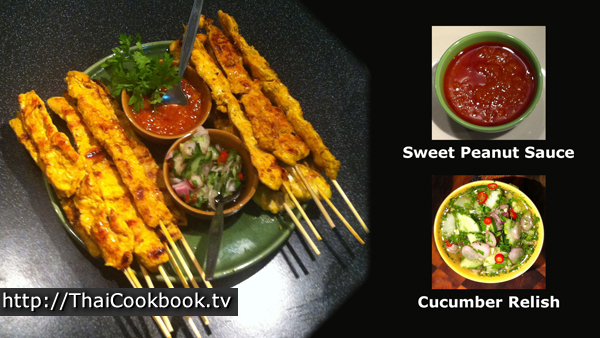 What's in our Pork or Chicken Satay. 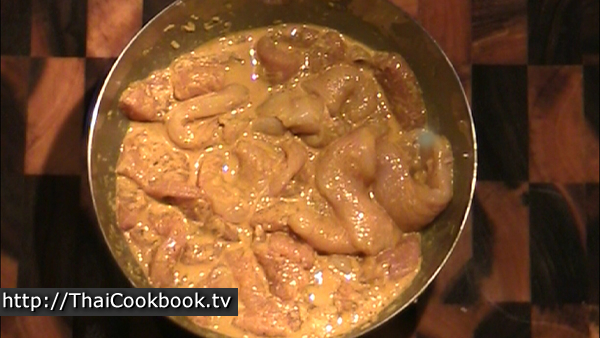 How we make our Pork or Chicken Satay. 1) Slice the meat into long strips about 1/4 inch thick. 2) Chop the galangal, lemongrass, and coriander root into small pieces. 3) Grind the peppercorns, cumin seeds, and coriander seeds into a fine powder using a mortar and pestle. 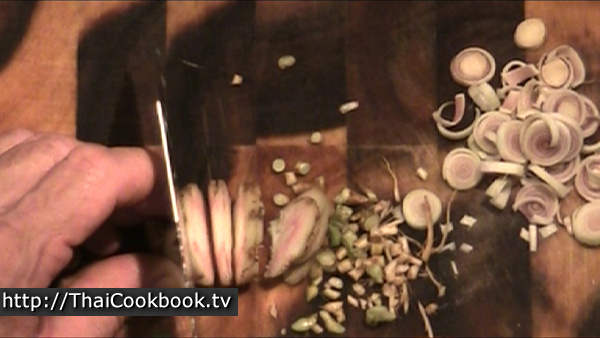 Then add the herbs from step 2 and continue grinding until you get a soft pulp. 4) Whisk the coconut milk, sugar, salt, turmeric powder and salt together with the herbs and spices. Poor it over the meat and marinate for 3 hours. 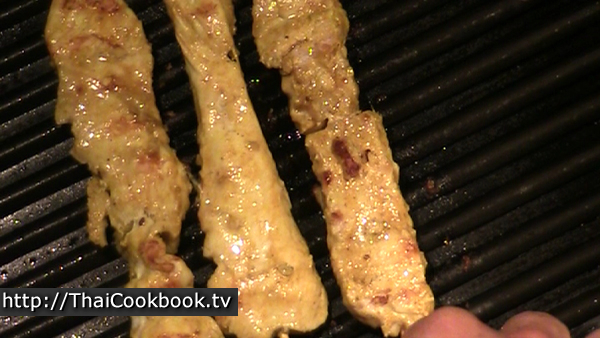 5) Thread the meat strips onto bamboo skewers and barbecue for 1 - 2 minutes on each side. 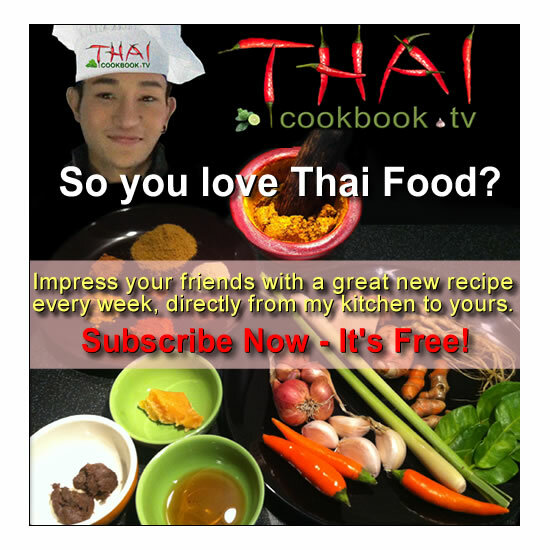 Serve with sweet peanut or cucumber dipping sauce. If using pork, start with nice thick pork loin chops with very little fat. Trim off the any fat that there is, and lay the chop flat on your cutting board. Cut into nice even slices about 1/4 inch thick. If using chicken, start with some nice plump boneless, skinless chicken breast. Cut them lengthwise into thin strips. Chop the galangal, lemongrass, and coriander root into small pieces. 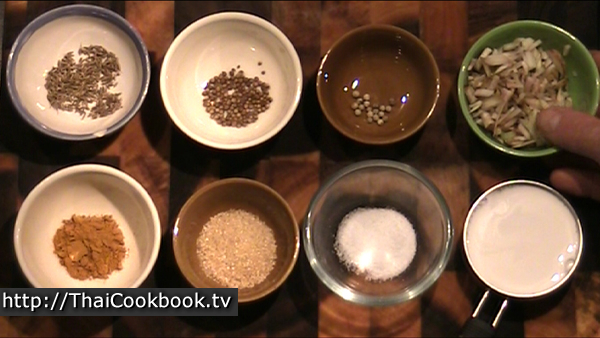 Measure and arrange the ingredients. 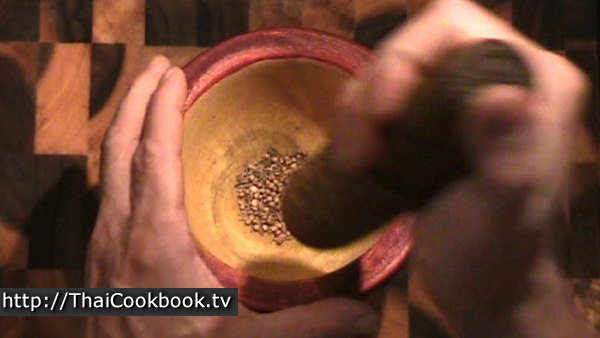 Grind the peppercorns, cumin seeds, and coriander seeds into a fine powder using a mortar and pestle. 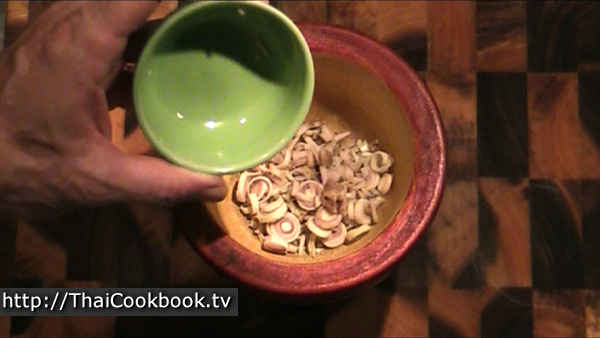 Add the fresh galangal, lemongrass, and coriander roots to the powder and grind together until you have a soft pulp. Whisk the coconut milk, sugar, salt, turmeric powder and salt together with the mashed herbs and seeds in a small bowl, then let it sit for about 5 minutes. 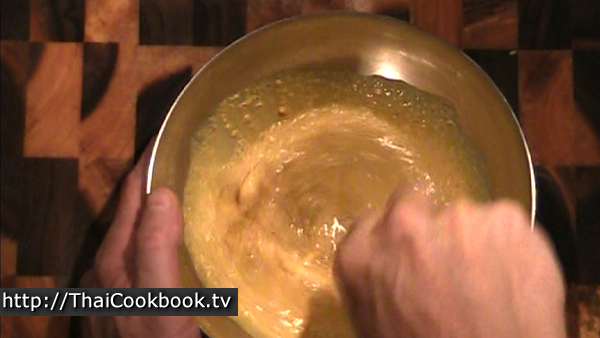 After sitting, stir it up well again, then pour the mixture over the meat and mix it in well. Allow it to sit and marinate at room temperature for about 3 - 4 hours, or overnight in the refrigerator. Meanwhile, if using bamboo skewers, soak them in water for at least an hour. This keeps them from burning when you cook the meat, but also keeps them from absorbing all the moisture and drying out the meat. Thread the meat slices onto the skewers, keeping the meat as flat as possible. Cook on a grill or barbeque for about 1 - 2 minutes on each side. Don't overcook, as the meat should be soft and juicy. Serve with sweet peanut sauce or cucumber relish.